Who is 251 Main Street? Formed out of a combination of necessity and desire, four freelance musicians gravitated toward each other to form their own nameless jazz quartet in 2007. 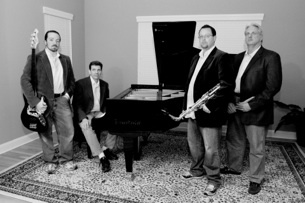 The personnel consisted of Tommy Ogle (saxophone), Chris Haley (piano), Keith Guillot (bass), and Tim Messer (drums). 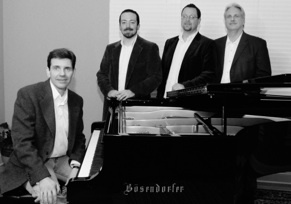 In late 2008, the nameless group became “251 Main Street” (a play on the standard jazz chord progression of “ii-V-I”), and their first demo CD was recorded. Each of the members had several years experience performing with each other in alternate music groups in the Chattanooga area prior to forming 251 Main Street. This combo features multi-faceted musicians who complement each other well, having over 125 years of combined musical experience, as well as having shared the stage with such notable artists as Wynton Marsalis, Arturo Sandoval, Doc Severinsen, and Three Dog Night. Their versatility and professionalism are top-notch and individually they have a long list of studio and performing credits. With a repertoire ranging from the 1920’s to present day, they truly offer something for everyone. Whether they are performing in shorts at a park, or in tuxedos at a country club, this group of professionals will lend a touch of class to your next event! Reserve 251 Main Street for your next event now! !